Doors are among the first things guests notice upon visiting your home. Ironically, they may also be the part of the house that takes the most beating. Just think of how many times in a single day we open and close our doors. Sometimes we even slam them when we’re in a hurry. Well-kept doors help give a pleasant first impression of your home. When you want to impress your guests, you don’t want them walking through doors that creak or have faded finish. Imagine your St. Louis French doors—a symbol of old-world charm and classic elegance—that have paint chipping off. They are energy-efficient. Well-maintained doors help you cut down your electric bills by preventing your heating and cooling systems from overworking. Cracks, tears, or large gaps allow heat to escape in winter and let it in during summer. Well-maintained doors protect you from the elements. If your doors are already giving in, they will not hold back rain, snow, sleet, and strong winds. They improve the overall comfort of your home. Nothing beats coming home to a comfortable dwelling after a long day at work or school. When you don’t have to worry about your doors squeaking or flaking off, you can relax and have fewer things to think about. When it’s time to replace beat-up doors, trust only industry experts to h andle the task. 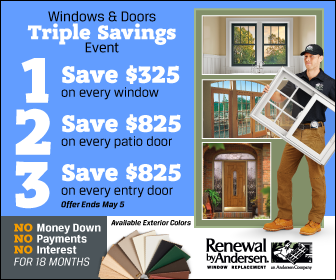 Renewal by Andersen® of St. Louis installs high-quality replacement windows and entry doors in St. Louis MO and surrounding areas. We take into consideration your budget, concerns with space, and sense of style to provide you with the best-quality doors and windows for your home. Call us today, and let’s schedule your free estimate!